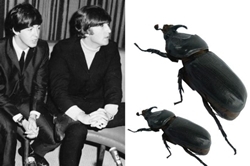 Can you beat The Beatles? The challenges of choosing a good band name . Beatles Radio: The Beatles, Solos, Covers, Birthdays, News The Fab 4 and More! Musicians can be a fickle lot. They can be unpunctual, slack with returning phone calls and precious about criticism. But if there's one area they can be some of the most frustrating people on Earth, it's in deciding a band name. Having played in countless bands, I can safely suggest that the more experienced, talented and democratic your group is, the harder it is to decide on a name. My last band, for example, had three different names for its first three gigs. In fact, by the third gig we simply went without a name because we couldn't agree. One of the best ways around it is to have a guitarist who assumes some form of pseudo leadership and everybody just nods, smiles and agrees to prevent them having a hissy fit.